A blog is a great resource to drive search engine traffic to your business. There are companies that use blogs to drive more prospective buyers to their main websites, and on the other hand we know people who just blog in specific niche to serve a targeted audience. There are a whole lot of Blogging tips all around the Internet and I would say it's the best resource could have. At BloggingeHow, I have been publishing tons of blogging tips all around the year since I started, Not that I know everything in the world, though I would share with my blog readers, what I share and what seems to work for my self. This page is specifically made to put together all the most important blogging tips for you so that it would be far easier to achieve your goals, then to roam around and looking for content that you need. Hope the posts below would really help you out. Before i let you go to take any further action, i would like you to subscribe for my free eBook guide that i compiled that incorporates A-Z steps that helped me get started. "6 Months to a 1000/per Month" is an exclusive eBook that i compiled over the time for my subscribers and what i share their (my income/ sources) isn't available on the blog. 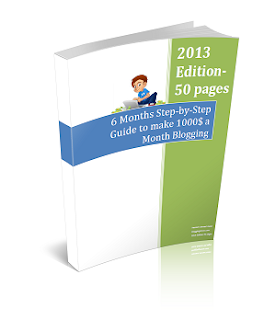 10 Facts That Tell If Your Blog Is Going To Be A Success? I hope these posts would help you out fairly enough to get started on the right track.